SS 2017 - CANGIARI STORE - Made in Goel s.c.s.p.a. SS 2017 There are 28 products. Organic denim wrap skirt finished with raw cut. 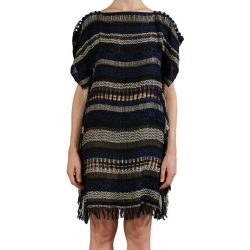 At the front, snap metal button closure is inside an asymmetric fabric completely handwoven, with fringed edges. Made in Italy. Read more! Organic cotton and linen dress completely handwoven. 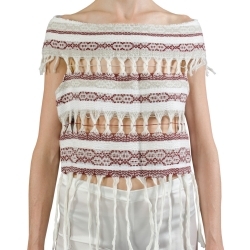 Fraying patterns on the shoulders derives from the sliding of a weft wire among warp ones. Kimono short sleeves. Fringed lower edge. Made in Italy. Read more! 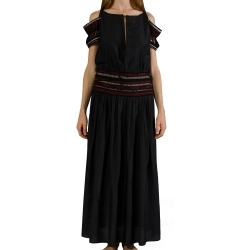 Organic cotton and silk long dress with soft fit. High-waist band is handwoven, off-the-shoulder sleeves too. Crew neck has handwoven stitches. Button closure on the back, over the central slit. Zip closure on the right side, over the other one. Made in Italy. Read more! Organic cotton and silk dress, hand-pleated. It has an asymmetric raw: classic empire line at the front, with handwoven band and mini length; halter neckline and length below the knee at the back. Made in Italy. Read more! Organic cotton and linen top completely handwoven. 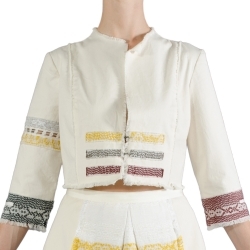 Fraying patterns and textures from Byzantine tradition make it precious. It has short sleeves, boat-neck collar and fringed lower edge. Made in Italy. Read more! Organic denim skirt finished with raw cut. At the front, handwoven insert with three colour bands and textures from Byzantine tradition make it original. It has organic cotton lining and fringed lower edge. At the back, in the centre of waist, zip closure with snap metal button. Made in Italy. Read more! Organic cotton shawl completely handwoven. Breaches among warp wires make it wearable as a gilet. 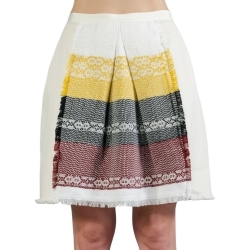 Textures from Byzantine tradition make it special: at the front, it is composed of horizontal bands alternating with frings, long below the knee. Instead, at the centre of the back, there are vertical bands with fraying patterns. Made in Italy. Read more! Organic satin palazzo trousers. 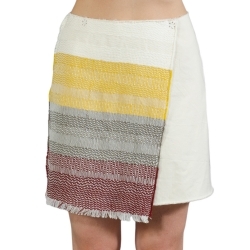 An asymmetric handwoven band stands on the waist: it is composed from horizontal textures also from Byzantine tradition. Zip closure on the right side. Made in Italy. Read more! 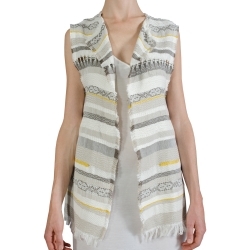 Completely handwoven gilet finished with raw cut. 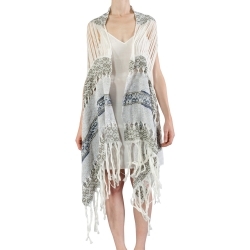 Symmetric, it has a soft fit and fringed lower edge. It is characterized by horizontal strips with different colours: inside them, textures from Byzantine tradition and a fraying pattern, on the breast. Made in Italy. Read more! 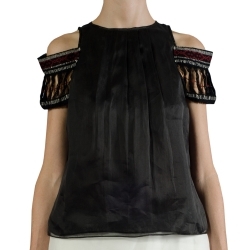 Pleated organic organza top with wide fit. It balances the consistence of organic cotton lining at the front with weightness of transparency at the back. Off-the-shoulder short sleeves are completely handwoven. At the back, in the middle of crew neck, bottom closure. Made in Italy. Read more!